Interested in becoming a CCBSA Sponsor? At all levels of sponsorship, your company name and/or logo will be listed on CCBSA conference materials and identified on signage for all CCBSA events at the conference. In addition, the name of the organization and/or official logo of sponsorships at the Silver Circle level or higher will be prominently displayed on the publicly accessible CCBSA website. CCBSA looks forward to partnering with you in support of the goals of our Association and we are pleased to extend this business opportunity to increase your exposure to a statewide audience. From its inception in 1984, the members of the California Clerk of the Board of Supervisors Association (CCBSA) deliver transparent public engagement using a variety of administrative and technical solutions. Unique to every California County, the Clerk of the Board serves as a vital link between residents and our respective County Board of Supervisors to ensure local government transparency in the form of publicized meeting agendas and minutes. We have great pride in our work to preserve and maintain the public record and provide support to citizen volunteers who serve on a wide range of committees and commissions. 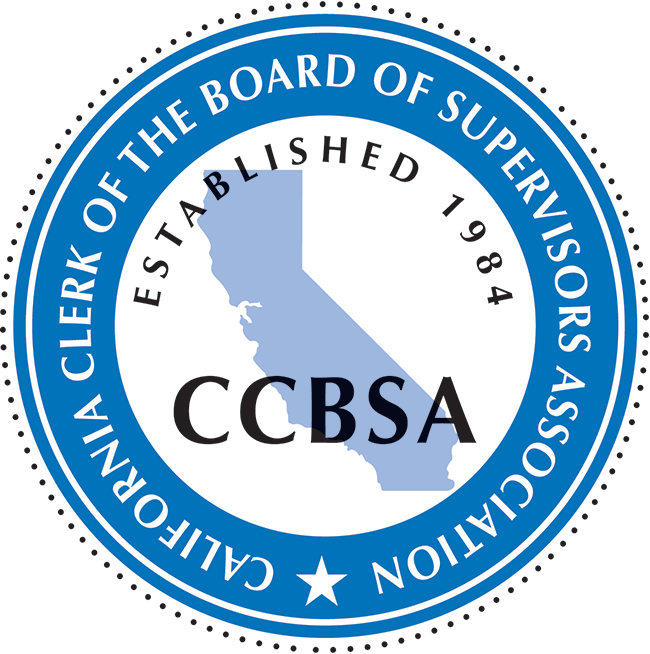 CCBSA serves as a collaborative platform for Clerk’s to earn their credential as a Certified Clerk of the Board through a combination of education and training engagements. CCBSA is proud to partner with the California State Association of Counties (CSAC) for our Annual Conference where Clerks, elected County Supervisors and other county executives come together to learn and share common interests in our collective service to citizens throughout the state. On behalf of CCBSA, thank you for your generous support in our continuing efforts to excel at providing outstanding service in local governance. Logos of Corporate Sponsors are uploaded on the CCBSA website upon receipt and will only remain on the site until June 30th of the following year.